Take your time ... digest slowly ... and enjoy!!! Really cool to get this email from Ian Lloyd, former Stories lead singer, letting us know about another brand new release! Thanks for the radio play / promo for “Everybody’s Happy Cause It’s Christmas Time” this past holiday season and for spreading the word. I’m sending out this announcement to you first before the rest of the world hears, so please check out the MEDIA RELEASE below. Thank you for your time and Happy Rockin'. and Isle Of Rhodes “Tick Tock”, taken from their debut release “All Rivers & Oceans”, www.isleofrhodes.com. Great ROCK from some unique talent. Help Spread the WORD & the SOUND round the world! “I started feeling that I needed to use this album as a catharsis, to express my own truth. It took longer than any other album, not because of time spent in the studio, but because of the subject matter of the songs I wanted to put out there,” Eric explains. The result is a deeply intimate, honest self-portrait as well as unsparing look at religion, politics and the environment. “During the making of this record, we lost Bo Diddley, one of my greatest influences. There were many things I would have said to him, if I’d realized that his time was limited. "I traveled to New Orleans to record with the Fats Domino’s band, something I wrote when Fats was presumed missing in the days after Katrina. The whole Katrina situation touched me deeply. It’s the birthplace of all the music that I love. A friend sent me a photo of Fats being rescued and it brought me such joy. I knew I had to put in words – and music – the relief that I felt. The struggle I had writing the material for this record was intense. "Global warming, the potential disaster of the water crisis.. too much water, too little water. I chose the title, because there are so many times in one’s life, when one feels he has nothing more to offer. But no, my river has not run dry. I offer this as a bit of hope that we, as the human race, will find new sources of replenishment and inspiration. "I never looked for money or fame, but I always knew I had to follow my own journey. As a kid in Newcastle, it was extremely unlikely that I would have an international career as a singer, lasting 50 years. I’ve been very fortunate. I’m a survivor, who doesn’t take his good fortune for granted. And that brand new Paul Simon / Graceland special we've been telling you about began running on A&E Friday Night ... check listings for repeat broadcasts. featuring a Lou Adler and Michelle Phillips Q and A session. "Wages of Spin" L.A. PBS KLCSDT 6/3/2012 9:00 PM Prime Time Los Angeles; following night KLCS 6/4/2012 2 A.M. It is being programmed on PBS affiliates Nationally all Summer long. Hope you're well. Thanks for all the coverage. We've heard from several Forgotten Hits readers wanting to know how they can finally see this film. Check your local PBS listings for local airings in your area ... and, of course you can buy your own copy on the PBS website, too! Mick was fantastic on SNL last week; watching it again; he was in practically every skit and his line readings were spot on. Jon Hamm, who's become almost a regular, was as funny as ever. I don't know him, but he must be loads of fun; his attitude and sense of humor is terrific. Wonder if he has his own security pass from 30 Rock by now? Mick's song with Arcade Fire was brilliant as was the Foo Fighters number. Just sensational; good sport he is. Really enjoyed the show. Next to the Jimmy Fallon-hosted one earlier this season, this was just a stand-out. I often consider "Surfin' Bird" the first hard rock record as well as a garage record. I am like you in that I didn't even know there was a longer version of BLACK BETTY. You mentioned that you have heard it some 20,000 times through the years. Consider yourself lucky (or unlucky ... however you want to look at it) ... I think the last time I heard it on the radio here in OKC was when it was initially out. Reader Don Effenberger suggested that you have a section on songs which made it to number one in various markets but didn't chart in the top 40 nationally. One of the first records that came to my mind was Freddie "HEY GIRL" Scott's 1961 recording of LOST THE RIGHT on Joy Records. For the week of April 27, 1961, it was number one here in OKC for two straight weeks. Didn't chart nationally I believe. It's the end of an era, as the long-running oldies music show on WJJG-AM, "Mike Baker and the Forgotten 45s," will air its final episode this Saturday afternoon. The station has chosen to cancel the show to focus on other musical programming on weekends. 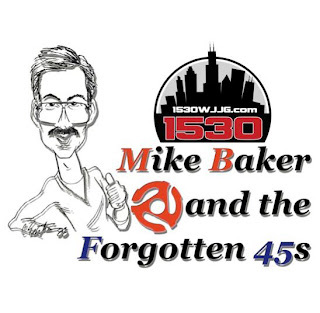 "Mike Baker and the Forgotten 45s," featuring Baker spinning popular and little-heard rock and pop tunes from the 1950s through the 1970s, has been on WJJG-AM for 17 years -- since May of 1995. Each weekend, since soon after Joe Gentile purchased the suburban radio station, Mike Baker would play songs from the golden age of Top 40 radio, including spotlighting many Chicago acts from that era. He would also host an annual multi-hour marathon of yuletide music live each Christmas on WJJG-AM, entitled "A Hometown Christmas." It would appear that last Christmas' 16th annual "Hometown Christmas" was the last one for AM 1530. Mike Baker was bitten by the radio bug back in high school, when he started spending his time working at Lyons Township High School's radio station WLTL-FM. From Lyons Township High School, he took broadcasting classes at Columbia College Chicago, where he worked at WCRX-FM, and Liberal Arts courses at Northern Illinois University, where he worked at WNIU-FM. Since leaving school, he has worked at such stations as WTAQ-AM, WCCQ-FM, and WFYR-FM. In addition to his professional radio work, Mike Baker has returned to his old high school to serve as student supervisor at WLTL-FM. He has done that since 1993. He has also lectured about radio at Columbia College and Prairie State University. Since 1984, Mike Baker has worked his day job as a systems analyst for the Chicago Mercantile Exchange. Baker will continue to work with WJJG-AM as the stations Operations Consultant and Webmaster. It is just his weekend music show that exits. New York, NY – May 21, 2012 – Q104.3, New York’s Classic Rock, announced today that its morning show host, Jim Kerr, was honored by HeartShare Human Services of New York during a house dedication ceremony on Wednesday, May 23, 2012. HeartShare, a nonprofit organization that provides residential services to individuals with developmental disabilities, will name one of its group homes for adults the Jim Kerr House. Kerr hosts the Jim Kerr Rock & Roll Morning Show weekday mornings from 5 - 9:00 a.m. on Q104.3. He has been a member of the Board of Directors for HeartShare Human Services of New York since 1987. To celebrate Kerr’s 25 years of dedication and commitment to the nonprofit organization, HeartShare will name one of its group homes for adults with developmental disabilities the Jim Kerr House. HeartShare Human Services of New York has 28 group homes and 35 supported apartments, in addition to all of its other services. The Jim Kerr House opened in 2002 in Flushing, Queens and is home to six women with developmental disabilities. Hey, Harry Harrison was great to listen to on WABC for me and before that was huge on WMCA in NYC, but I never knew he came from WCFL and WPEO Peoria! This is a REALLY cool item, I think! When you go to this site you will be directed to select the player of your choice. Check out this Bobby Darin Double-Play. I say it's never too early to dance with The King Of Rock & Roll. More Micky from Epcot Center's Flower Power Extravaganza! You'll find More of the Monkees here ... as Peter, Micky and Davy sing one of Mike's songs ... which is actually a Michael Martin Murphey song ... on something called "People Are Talking". I’ve never seen this clip before. Enjoy! New York, NY—(May 22, 2012) – Roger Hodgson, the legendary voice of Supertramp, recently completed the first leg of his “Breakfast in America Tour” with sold out shows across the US and South America. On June 6, Hodgson heads to Germany to kick off a summer run through Germany, Holland, Italy, France, Luxembourg, Belgium, Spain, and Switzerland, before returning to perform in North America in August. Fans the world over have been thrilled with Hodgson’s unforgettable songs such as “Breakfast in America,” “The Logical Song,” “Dreamer,” “Give a Little Bit,” “Take the Long Way Home,” and “It's Raining Again.” Hodgson and his band perform these timeless songs worldwide, as they take you on a magical musical journey. Universally recognized as one of the most gifted composers and songwriters to have ever put pen to paper, Hodgson helped define a generation of progressive rock. Founding Supertramp in 1969, Hodgson’s dulcet tones and beautifully crafted lyrics helped the band sell in excess of 60 million albums, transforming them into a worldwide phenomenon. Reflecting on his tour and DVD, Roger said "I love performing these songs, which continue to resound for me as a performer and for the fans. My songs come from a very personal place inside me and they carry my beliefs and my dreams and my philosophy of life. I understand the deep connection that fans have with my songs that have been a part of so many peoples’ lives around the world." For a chance to experience the magic first-hand before Roger arrives in your city, tune-in to the livestream on the DW homepage. Check listings for Euromaxx airing June 1-2 and 3. Tom Petty is also wrapping up the foreign leg of his tour ... and says he'll be announcing US dates shortly. Hoping Chicago's on the list ... he's on my list of artists that I have always wanted to see live but never actually made it to a show! 5/23/2012 - Asheville, NC - Music legend and original YES vocalist and songwriter Jon Anderson will be playing select concert dates this summer in support of his critically acclaimed new digital download release 'OPEN'. Jon Anderson, who has one of the most recognizable voices in music, and is best known for his work with YES, Vangelis and Kitaro, as well as his innovative solo efforts, recently completed several successful tours of the US and South America. The new summer tour promises to deliver an exciting mixture of material from Jon Anderson's prolific solo career, collaborations with Vangelis and classic YES songs, along with songs from his latest CD 'Survival & Other Stories' and new compositions, highlighted by humorous and enlightening stories told by Jon. Jon is currently recording part two to his recently released 21-minute musical opus 'OPEN' titled 'Ever'. "Music is constantly happening all around me. I'm busy working on 'Ever', a follow up to 'Open', part two of my journey into the longer form music I love to create." Also, Jon is working on the highly anticipated sequel to his critically acclaimed first solo album 'Olias of Sunhillow' titled 'Zamran' “Zamran is slowly finding me, or I'm slowly finding Zamran (Son of Olias), sometimes good things take time I'm told. with love...many blessings...Jon Anderson"
One of my favorite DJ stories happened in September of 1967. Red Foley was making his last tour of the Western US and landed in Salt Lake City. He brought along two country singers that were based out west, Lynn Anderson, who had made it to the C&W charts three times by then, but was still several years away from "Rose Garden". The second act was just starting to part the curtain to major stardom, as his "By The Time I Get To Phoenix" had just come out and it was already on my station chart (KMOR). Yep, we had Glen Campbell in town. For the record, we'd charted the John Hartford "Gentle On My Mind" and when Glen's arrived, it went right into the control room, and went Top 3. Lynn led off and did about five songs, then headed up the aisle I was on (a theatre in-the-round). I introduced myself, and she suggested that we sit and visit a while. Glen then arrived on the stage and Lynn quit visiting so she could listen to Glen, which was my thought, too. About halfway into Glen's second song, Lynn can't help herself ... and she starts singing harmony along with Glen. I'm the only one who can hear her, so I enjoyed my own private stereo concert with Glen on stage and Lynn next to me. After the show, Glen, his band mates, another DJ, myself and the Capitol records rep spent about an hour at a local night club where Glen sat in with the house band. We then all moved over to a hotel coffee shop where I listened to all kinds of insider gossip, heard all kinds of jokes, and finally left them behind at 5:30 AM so I could do my 6 - 9 AM radio gig. I count my blessings every day that I did the radio DJ thing. More stories and fun then a guy should have. Keep up your good work and thanks for the columns! The thing is, I was of drinking age in 1976. I did not know disco was going to become disco at the time. it was just dance music at first and then got labeled. It was drinking age days and disco was the sound. I will always love the era before 1972 most, but I do have sentimental faves that are disco simply because they reminded me of a drunken fun time OR they actually WERE just plain good records one could dance to! "They had a good beat and you could dance to it." The Bee Gees songs were a GOOD part of that. I was there loving the "Mr. Natural" album in 73 when no one wanted to play the band's records. Check out "Heavy Breathing" from that LP and you can see where "Jive Talkin" was soon to evolve from. My fave was "Throw a Penny" which spent three weeks atop my personal charts in 1973, a 45 that did not reach the Hot 100!! So many great songs! Can you believe they even did a song about South Dakota?? Have they EVER been to South Dakota?? I, too, hated disco at the time ... but I never really considered The Bee Gees to be a disco band ... they just got lumped into the whole movement ... and it hurt them dearly in the long run ... a great run of hits (six straight #1 records!) but then they were virtually blacklisted by radio for the next two decades ... and all this despite the fact that they were creating GREAT music during this era. >>>For the record, The Bee Gees were already writing and recording tracks for what was supposed to be their next studio album ... and "How Deep Is Your Love" and "Stayin' Alive" were already in the can ... with "Night Fever" nearly complete as well. When their manager Robert Stigwood approached them and told them that he had just signed on to produce a new film, he simply asked "What have you got?" It was just another lucky musical happenstance ... The Bee Gees abandoned their new LP and began crafting songs to be used on the soundtrack of what was to become "Saturday Night Fever", eventually filling in the gaps with a few of their older tracks (like "You Should Be Dancing" and "Jive Talkin'") and writing new material like "If I Can't Have You" and "More Than A Woman" ... both originally planned as Bee Gees tracks but then given to Yvonne Elliman and Tavares respectively to break up the monotony of the soundtrack a little bit ... and a MAJOR hit was born. Though Barry Gibb has been quiet since the death of his younger brother Robin, a new video released by the surviving Bee Gee is a loving tribute to his fallen bandmate. The video, posted to Gibb’s personal YouTube page on Tuesday (May 22), takes a look at Barry, Robin and Maurice (who passed in 2003) as well as youngest brother Andy (who passed in 1988) over the years. Set to the Bee Gees’ “Heart Like Mine,” the nearly five minute clip is made up of the brother’s personal home movies that follow them from childhood to superstardom. It also shows candid moments of the Gibbs goofing around that gives a sense of how close they really were. Barry named the clip, “Bodding,” as a nod to his brother’s childhood nickname. Robin Gibb died May 20 at the age of 62 after a two-year battle with liver cancer, which eventually spread to his colon. Barry is the only surviving member of the Bee Gees. Grab a Kleenex and watch the touching tribute below. I still feel sad every time I think of the passing of Robin Gibb. Lately, it's reminded me of that song by Carly Simon "His Friends Are More Than Fond Of Robin", from her "No Secrets" album. While I know it wasn't written about Robin Gibb, it still seems to fit somehow ... and just makes me miss him that much more. I think the Haley records are not mentioned as much for 1st Rock 45 because they were released later than a lot of the earlier ones like “Good Rockin Tonight”, which is from the 40’s. Granted Rock Around The Clock and Shake, Rattle & Roll are two of the 1st real mega-hits of the Era. Maybe, a couple of their earlier efforts like “Real Rock Drive” might be more appropriate. Chuck brings up a good point. My collection is really tough to deal with now that it has a lot of dust on the 45s and Lps that I have not touched recently. When will it be time to say goodbye to this stuff? I don't know how I could tell anyone what to do with it all before the day of reckoning comes. I have lists and things, but only I know about what is here and where and I often don't know either. I guess I'll have to live on! Or quit my job and sell on ebay until the vinyl or money runs out. Haha. I'm not sure you haven't done this before ... but it might be time again. Ron & Fez on satellite radio challenged their interns to come up with the song most used in movies & tv shows (given 24 hours - they made lists) ... they were obviously too young & non-movie savvy to pick anything but VERY recent songs that can't possibly be even near the top the list. How about challenging your readers to the same thing? AND GETTING A REAL TOP MOVIE SONG (or list)! I thought you might enjoy this Kent. I found it most interesting. I really appreciate all of your comments on "Imagine there were no Beatles." I think my question was really meant to be two-fold ... what would have happened to pop music around the world, OR in this country, had John not put the band together. Yes, it only would have been a matter of time, if Ed Sullivan had not seen them in London, but I do remember when ABBA was, without question, the number one band in the world, but not even close to that here in the States, so maybe this would have happened to The Beatles, too. I don't know if I was as big a fan of the guys from Liverpool, as everyone else was, but I felt sad for the demise of some pop stars, especially, the folk music movement, and my all-time favorite vocal group, the Kingston Trio. The trio was proclaimed "the band that built the Capitol Records Tower", but were regarded as "retired", when The Beatles signed with the label. We all know that many folkies went on to form folk-rock groups. I still would like to hear more comments on the question of "what do you think would have happened?". Maybe Casey Kasem could share his vision, sometime. By the way, Casey recently turned 80! Where has all the time gone? I think it is SO funny how you keep referring to the Singing Nun's "Dominique"! Maybe this country found spirituality in the song, after the JFK assassination, don't you think? Anyway, when I hear "Dominique", or hear about song, I think of a real cute TV performance of puppets, dressed as nuns, dancing in circles to the song, and one of them plays the guitar. I don't know which variety show I saw it on, but it was precious!. I tried to find it on-line, to send you, and get your reaction, but no luck. And the comments just keep comin' ... so we're sharing a few more with you today! I am wondering if you saw Mick Jagger host Saturday Night Live this past weekend. I thought he was a natural! No problems with the monologue and presented MUCH better than 90% do as guest hosts. He performed great Stones songs from "Last Time" to "19th Nervous Breakdown" to "It's Only R&R" as well as a new song he wrote about the political situation with Jeff Beck on blues guitar. Then, he was in most of the skits as well! Many not funny, but he was great. The best was the karaoke bar where guys kept going up and singing Jagger tunes while he sat there saying "Jagger doesn't do that." Then, his impersonation of Steven Tyler on American Idol was good, as one could imagine. All in all, one of the best SNL shows (not sayin much there) I have seen in a long time. This was supposed to be bad. A tired rock star giving the middle finger to bandmates who can't tour without him. What is it with Jagger ... He can barely enunciate on the Super Bowl, the live shows are creepy, then he goes on the Grammys and tears it up and delivers here. Huh? But he couldn't have done it without Arcade Fire. It would have been criticized on "The Voice", but those phonies have no idea what's real. And tonight Mick reminded the rest of us that money can't buy you love and there's no joy like making (and listening!) to music. How are The Trashmen doing? I thought I'd share some thoughts with you as I go plowing through my record collection for my annual inventory. My, how that does stir up the cobwebs. I checked your "B-sides list" and I need to mention a few. Absolutely one of the worst produced and engineered records I ever heard, and yet I love to listen to it is "Don't You Worry, My Little Pet", a Phil Spector production on the flip side of "To Know Him Is To Love Him" by the Teddy Bears. I'll also mention the two "That's My Desire" flip sides, from Dion & Belmonts and also the Lettermen. Sorry bout the Bee Gees errors I made. I was writing quick before bed and not for broadcast worldwide on CNN. haha. Point noted ... my only thing was showing that it happens to EVERYBODY ... happens to me all of the time ... my mind knows EXACTLY what I want to say and then I'll transpose a wrong name or something, even thought I knew exactly what it was SUPPOSED to say! (I've thought about getting one of those "Say And Type" things for the computer ... but the one's I've seen aren't very accurate ... right now they make more mistakes than I do ... so I muddle along!) No harm, no foul ... but we HAVE to set the record straight on stuff like this. Boy, you guys have a lot more admiration for disco and Saturday Night Fever than me. For The Rockers it was part of the downfall of Western Civilization!